This is the time to celebrate Ganesha festival in our India. There are many mythological stories about the lord Ganesha and some beautiful knowledge about the shuttle aspects about those stories that reveals the secrets of lord Ganesha as binding energy of different sets (GANAAs). Today I will write about lessons from Ganesha for progressing in corporate ladder. How they are applicable to our day to day work lives! Let's see. The big head stands for wisdom. It contains millions of mental hooks to hand the ideas that come through experience and exposure via the big ears (listening) and narrow eyes (for focusing, focusing and focusing!). The long nose is to probe around! An excellent way ti gather information for your self-improvement manual! It is flexible, moves 360 degree ! The small mouth is to speak less and to ask questions, sometimes even stupid questions, to get excellent answers which can then be hung on mental hooks in the big head. The teeth represent hidden assets! Now, four hands to me represent “delegation,” when you ask or instruct others to help you to get things done! It’s so necessary to achieve goals in life – short, medium and long term – at home and in the office. The elephant generally walks in a very leisurely manner, waving and wondering, but slowly, slowly and surely reaches the goal. Never in a hurry. An elephant never has a heart attack! These and many more qualities of the elephant gave it the status of Lord Ganesha in our mythology. Ganesha was not born a god! Though he started to totem he rose to the “ranks” of God, to be worshipped before Brahma, Vishnu and Shiva. 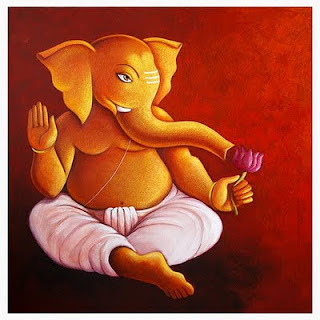 A sub-ordinate who is not a Ganesha is a GobarGanesha – the other end of our elephant! As I look at life, I can be a Ganesha or a GobarGanesha - as a son, a father, a grandfather, a consultant, an employee or employer, and so on. In fact, from day to day we tend to swing like a pendulum from happy Ganesha to Ganesha to GobarGanesha – back and forth, from minute to minute, hour to hour, day to day, and year to year. But it is up to us which mode we are in most of the time. Excerpts from the book "Simple Ways to Make YOUR BOSS SUCCEED!" By Promod Batra and Vijay Batra. So this year Ganesha festival, let’s all pray to the almighty for blessings, that we retain the our status as Ganesha most of the time. A happy Ganesha mode. And let’s play our different roles in our lives with 100%. I posted such article earlier Woh Shaam Kuchh Ajib Thi..., that was also a book excerpts. And few more articles about Ganesha. Let me know do you like this article? keep writing such nice things.which only Manish can write.